Summer movie season gets off to a swinging, web-slinging start this weekend with the launch of "The Amazing Spider-Man 2." The film, which officially opens in U.S. theaters Friday but gets a head-start from some showings Thursday night, brings back Andrew Garfield as Peter Parker/Spider-Man, Emma Stone as his love interest Gwen Stacy and director Marc Webb ("500 Days of Summer"), along with franchise newcomers like Dane DeHaan as Harry Osbourne and Jamie Foxx as the villain Electro. "Spider-Man 2" is poised to open big at the box office -- estimates have it on track for a $90 million weekend, in addition to the money its already made in overseas markets -- but critics' takes on the film have been less than "Amazing." "Marvel intends this to be the meat in a superhero sandwich, between the early-April 'Captain America: The Winter Soldier' and 'X-Men: Days of Future Past,' arriving in just three weeks. There's little doubt that 'The Amazing Spider-Man 2' will make zillions as the first blockbuster of the summer season. But this is not so much a movie as a business proposition, less an event than a seat-filler; it lacks the clarity and emotion of its predecessor." -- Richard Corliss, Time. "The eponymous hero hits his super-heroic stride here, as does Andrew Garfield in the role, especially when Spider-Man's alter ego Peter Parker learns there's always some fine print in a contract with this many benefits. The plot gets itself tangled up in multiple villain strands, but in the main, this installment is emotionally weightier and more satisfying than its predecessor." -- Leslie Felperin, The Hollywood Reporter. "Mr. Webb has some fun with the image of Spider-Man swinging through the urban canyons, and there are moments -- as when the image freezes on the tucked, airborne Spider-Man, ready to spring into action like an Olympian -- in which the movie taps into the giddy freedom and near-unboundedness that the character's physical transformation has brought him. ... Once he comes down to earth, though, the movie does, too, with scenes of heavy destruction that quickly grow monotonous." -- Manohla Dargis, The New York Times. 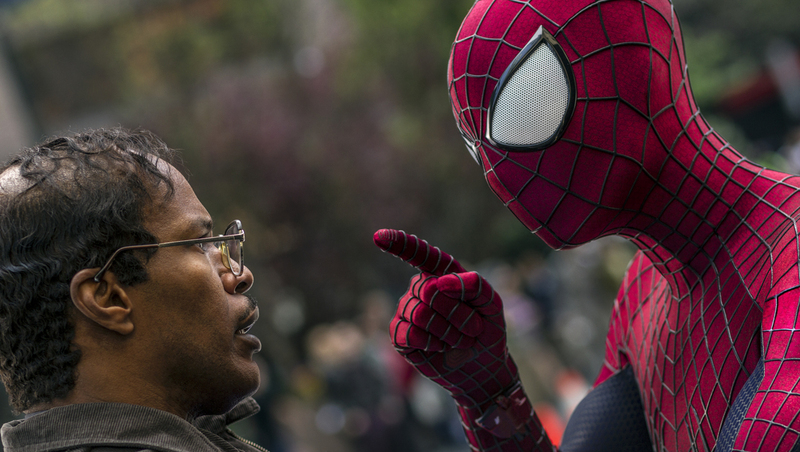 "'The Amazing Spider-Man 2,' the fifth Spidey movie in 12 years, is overlong, underwhelming, unnecessary and sure to be a hot ticket. ... Despite the law of averages, audiences still think there may be life left in the Marvel hero with the web thingies. And the team responsible for dressing up the corpse is just gifted enough to fool us maybe one more time." -- Peter Travers, Rolling Stone. "Director Marc Webb's dizzy, slickly enjoyable sequel gets a ton right. It's a Marvel spectacle that manages to deftly balance razzle-dazzle, feel-it-in-your-gut slingshot moments of flight and believable human relationships. There's psychological weight to go with all of the gravity-defying, webslinging weightlessness." -- Chris Nashawaty, Entertainment Weekly. "Aerial sequences are often thrilling. However, interpersonal relations are front and center in this installment. Not only does the heady teen romance keep us riveted, but Peter's effort to learn more about his family is fascinating. At almost two and a half hours, the film is overlong and grows hectic at times, though it cleverly balances lighthearted thrills and emotional heft." -- Claudia Puig, USA Today. "Andrew Garfield and Emma Stone don't just have chemistry on screen. They've got a rare Hepburn-and-Tracy-esque naturalism that flits from awkwardness to ease to unquestioned devotion in the space of a few shared glances. They don't just have spark, they have a buzzing, crackling electricity with power enough to light the New York City skyline. It's a pity, then -- both for Peter and Gwen, and for the movie -- that they keep getting interrupted by Electro (Jamie Foxx), a buzzing, crackling, energy-sucking villain with enough power to darken the New York City skyline. Not to mention Harry Osborn/Green Goblin (Dane DeHaan), who also shows up to cross these lovers' stars some more, and Rhino (an utterly wasted Paul Giamatti), who appears as an afterthought. Because what superhero movie doesn't benefit from an extra villain or three? (Answer: very few.)" -- Ian Buckwalter, NPR. Tell us: Do you plan to see "The Amazing Spider-Man 2"?